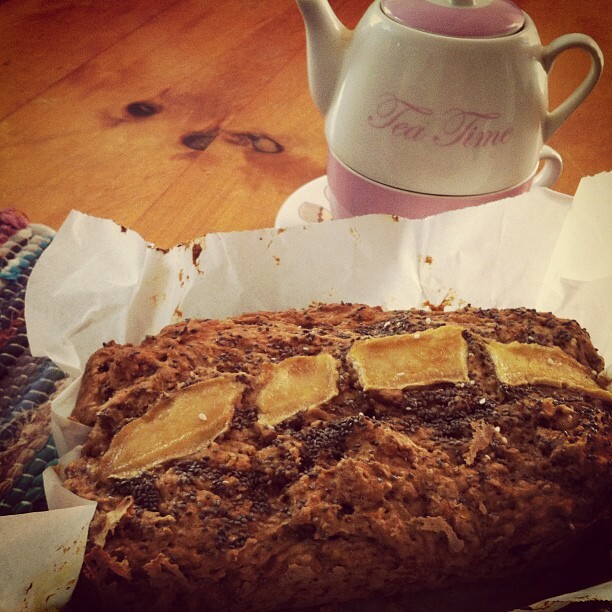 Banana Bread has got to be one of my all time favourite treats. Here’s a recipe I created this week when I noticed my bananas were looking a little dark. This recipe can be made gluten free simply by using your preferred gluten free flour (such as rice flour) or even almond meal. For this recipe I used spelt flour (which contains gluten) and found it worked really well. Mix LSA with water, stir well and leave it aside. Mash the banana really well. In a big bowl sift together the flour, baking soda, baking powder, salt, cinnamon and mix well. now add the chopped dates and maple syrup and stir together. Add the mashed banana and LSA mixed with water and stir till it’s combined. It’ll be a hard dough but don’t be tempted to add any more water and do not over mix. Just stir till it forms a hard dough. Fold this into a greased loaf pan and sprinkle chia seeds on top. Bake for 50 to 60 mins till it’s well risen, crusty and golden on the outside. A toothpick inserted right in the center has to come out clean and that’s when the loaf is cooked. Have you LIKED me on Facebook ?